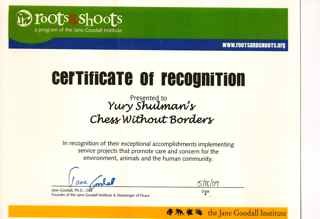 Yury Shulman International Chess School was founded in 2005 by Grandmaster Yury Shulman and Rishi Sethi. Today, we teach chess in over 25 schools, served over 50,000 volunteer hours and have educated thousands of students. The concept of chess and philanthropy was born from a simple idea that children can volunteer and accomplish things together. In fact this concept may have its roots in the nature of chess itself. Often children who grow to love chess enjoy the competition, socialization, diversity and sense of accomplishment it generates. 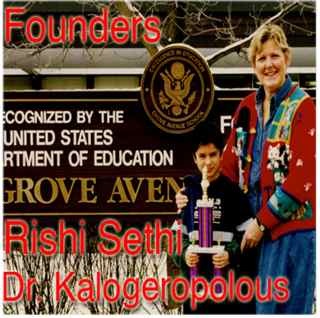 Rishi Sethi, the founder of this concept was only 9 years old when he conceived this idea largely because he embraced chess with all its possibilities. He saw his older sisters rack up volunteer hours and felt his little chess group could do just as much as his older siblings. Rishi with his burning enthusiasm for chess was able to gather 23 students to form the 1st chess club. Soon after it was formed the group began teaching chess at a nursing home across the street from their elementary school and they discovered that volunteer work was inspiring, built confidence and they felt like they were all leaders. “ We are all teachers,” said 9 year old, Mark and “ It’s like traveling and meeting new people” explained another student from this group. Instinctively, the children were being able to expand their learning into creative areas where they could imagine a project and implement it with the help of their group. Later on as a result of their services the group was talking to reporters, collaborating with local businesses and working to enroll more volunteers. 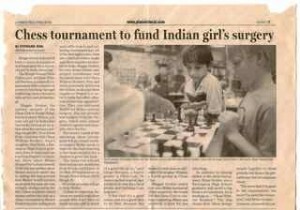 Initially the decision to select a charity to benefit came from a simple ability of the chess students such as Rishi and his friend David to understand what the charity accomplished. This is why the first charity selected was Heifer International, which is a charity where livestock is donated to needy families in order for them to become self-sufficient. The entire proceeds of this tournament were donated to Heifer and the children were thrilled to have made donations of livestock. Later on as this tradition became established requests are made to the group for support. Some of these requests come from the community and chess students create others. For example a community member informed the chess group that animal shelters are suffering with this economy so last tournament $ 100 was donated to a local shelter. Chess students often travel to other parts of the world and request chess sets or textbooks to donate to underprivileged schools. Participation in the service projects is usually on a sign up basis but cash donations are made from a portion of the proceeds of a tournament so 100% of the students support the venture. Sometimes local non-profits who are the featured beneficiaries are able to attend the tournaments or bring posters to explain the role of the charity. Children enjoy interacting with staff from the non-profit as they run around in between matches. These informative sessions provide an educational service for the community fostering understanding and respect for work, which is important in society. 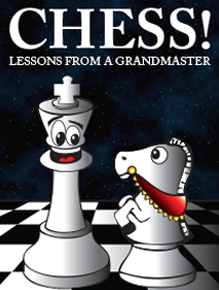 The ideals met from this relationship between chess and philanthropy provides social, emotional, cognitive and economic educational benefits to the students as well as the community. Children transform themselves into leaders through providing services. They learn to share their time and understand the value of opportunities they have because they visit rehabilitation centers or underprivileged schools where others have so little compared to them. Similar to a situation in a chess match there is an excitement to win which drives the students to excel in their projects. For example, this winter, an 8 year old boy going on vacation to his grandparents home recruited his grandparents to help him set up a chess club near their home. But a few days before leaving on his trip he called and wanted to donate more chess sets because “ We will be setting up chess clubs in 4 schools now instead of 2 schools”. The year 2008 continued to expand the possibilities of chess and philanthropy with Chess without Borders. Through its enthusiastic students chess was introduced into Nigeria, Sudan, Germany, India and Malaysia. Chess ambassadors who travel on holiday eagerly carry chess sets and a textbook by GM Shulman to donate in needy schools. In fact chess students have inspired the community to help establish chess clubs around the world. Citation for the program from Illinois Senator Barak Obama and Congresswoman Melissa Bean. 70 students and 5 teachers awarded The Presidents Volunteer Service Award form The White House. Simultaneous Chess match held at Community Unit School District 220 by the Woman’s World Champion Grandmaster Susan Polgar. Chess Tournament hosted by chess volunteer and former Bulls Basketball player B. J. Armstrong at Barrington High School. Founder of the chess program Rishi Sethi won the Prudential Award, Presidential Freedom Scholarship Award, the AXA and US News and World Report Scholarship Award and is the Finalist for the 2008 Harris Wofford Award.Sujit Johnston won the 2012 Kohl’s Award and other students have won various awards for their service with the program. Finalist for the 2009 Chicago Innovation Award for innovative education. Citation from The Jane Goodall Institute in 2009 and 2012 for implementation of humanitarian projects. Produced a documentary “A Future for Meher” chronicling the humanitarian work done by the program. This was entered in the 2011 Emmy Awards and the 2012 Elgin Film Festival..
Several students continue to volunteer, win awards and scholarships for their work with the program. Program has donated $75,930 to various charities through chess events. Youth from the program are invited to attend the UN Youth Assembly in New York for their humanitarian work. 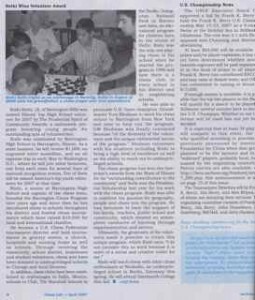 Article in Chess Life Magazine about the Program and its beginning.